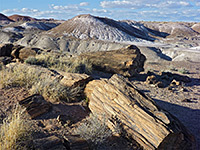 Although the largest concentrations of the most colorful fossils in Petrified Forest National Park can be viewed from several short paths and roadside overlooks along the scenic drive, off-trail hiking is not allowed in these areas. 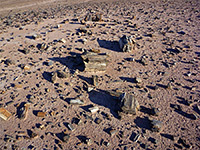 Petrified wood can however still be seen in natural surroundings in the Black Forest, in the north section of the park. The logs here are darker in color so not quite as pretty, but in all other aspects the scenery is just as good, if not better; the wood includes many complete trunks, 50 feet or more in length, spread out over undulating, multi-hued badlands split by shallow ravines and plateaus with usual rock formations. Several logs span dry washes to form natural bridges, though all are broken in one or more places; the most well-known example (Onyx Bridge) collapsed several years ago. Black Forest is also the only region of the park where backpacking is allowed, yet despite the abundant petrified wood and varied scenery, visitation is very low. A hike to the vicinity of Onyx Bridge is a 5 mile round trip, relatively easy since the terrain is mostly level; seasonal hazards include rainfall which makes the clayish earth difficult to walk over, and the extreme heat of midsummer. 19 views of the Black Forest. 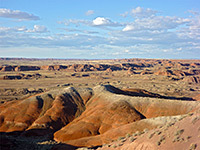 Most of the land in the north of the national park is a wilderness area, the boundary being 1 mile beyond the northern section of the scenic drive, where it runs along the edge of a protruding mesa, past several overlooks of the Painted Desert badlands. The trail begins at one such overlook, Kachina Point, on the west side of the recently restored Painted Desert Inn, which now contains only a bookstore and museum, no longer offering food and lodging. Like all areas of the national park, visitors (unless backpackers with permits) must return to their vehicle by 6 pm, so a hike to the Black Forest has to begin no later than 3 pm in order to have enough time for exploration. The first part of the hike is on a developed trail, zig-zagging steeply about 250 feet down from the mesa top, through a band of reddish badlands and small washes then over less steep hills to the extensive, clayish flats enclosing a much larger drainage (Lithodendron Wash, usually dry) a little way ahead. The path fades away once down from the mesa but the route is straightforward - the destination is the east edge of another series of hills 1.5 miles away, slightly west of due north. 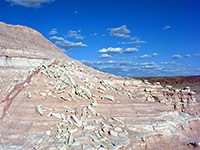 Other scattered ridges and mesas rise to the north and east, all predominantly red in color with narrow whitish bands, and formed of the Petrified Forest Member of the Chinle Formation, the stratum which contains the greatest number of fossils. The wide valley floor marks the top of the underlying Sonsela Member. The route follows the wash part of the way, a section running generally north-south then veers to the northwest, up any one of several small tributaries. 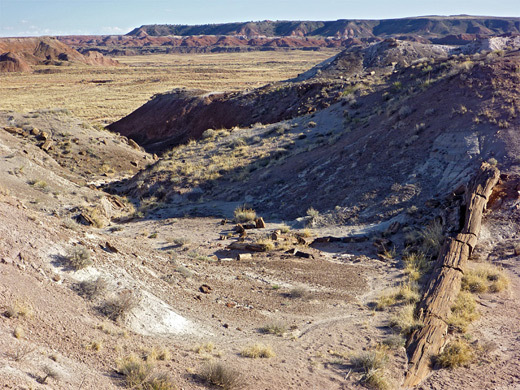 Onyx Bridge is located 0.2 miles up one such wash, its location inaccurately marked on older topographic maps; the feature indicated on the these is also a broken log over a wash, but not quite as long. 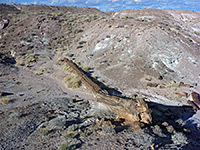 There are countless other pieces of petrified wood over the adjacent gullies and hills, ranging in size from tiny, angular fragments to complete trunks, up to 6 feet in diameter and 60 feet long, spread out along the edge of the mesa, about 50 and 100 feet above the valley floor. 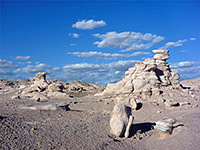 A short distance further north, the reddish hills are bordered by a slickrock plateau, where thin layered sandstone, variously white, grey and pink in color, has eroded into small-scale hoodoos and cliffs, all quite photogenic.